Genes in living cells are activated – or not – by proteins called transcription factors. The mechanisms by which these proteins activate certain genes and deactivate others play a fundamental role in many biological processes. However, these mechanisms are extremely complex and scientists have been spending years trying to unlock their secrets. Scientists usually study gene expression by introducing specific DNA sequences into cells and observing how the cells react. But this labor-intensive method is complicated and can vary from one experiment to the next. In an important step forward, scientists at EPFL's Laboratory of Biological Network Characterization (LBNC), headed by Sebastian Maerkl, have developed a quantitative, replicable method for studying and even predicting gene expression. It uses a cell-free system in combination with a high-throughput microfluidic device. Their work allowed them to build a synthetic biological logic gate that could one day be used to modify cellular functions. The research has been published in PNAS. Nadanai Laohakunakorn, a coauthor of the study, explains how the method works: "First we extract material from inside the cells. This 'cell-free' system consists of enzymes and chemicals that the cells use to carry out their normal biological processes. Interestingly, we can restart gene expression outside the cell by feeding the extract with fuel and information, in the form of high-energy phosphates and DNA. Because the process closely mimics what happens in living cells, we can use our platform to investigate a range of biological phenomena without having to modify living cells each time." 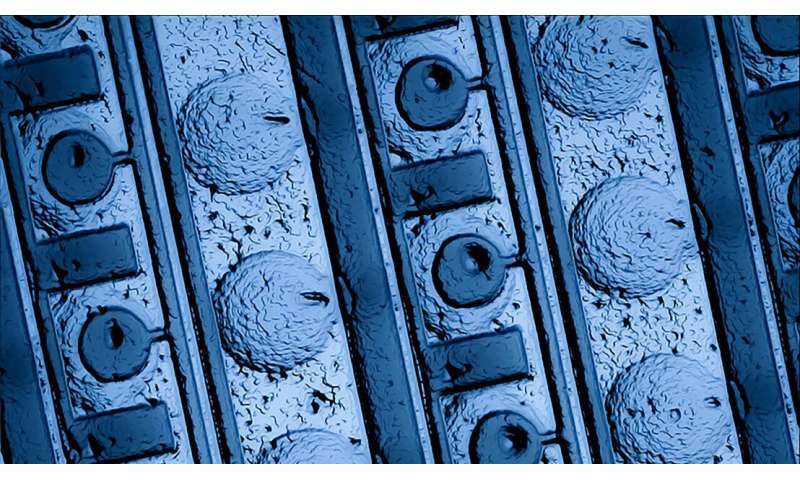 For their quantitative study of gene expression, the scientists examined thousands of cell-free reactions on a microfluidic chip – that is, a device used to manipulate microscopic quantities of liquid. "We were able to test several different scenarios and build a quantitative library of synthetic transcription factors, which allowed us to predict the influence of a given protein on a gene," says Zoe Swank, another coauthor of the study. "Our method can be extended to build fairly complicated systems." The scientists' method has several advantages. First, cell-free systems can imitate systems within cells, yet they are much simpler, and their mechanisms can be modeled mathematically. This means that they can help contribute to understanding more complex biological phenomena by breaking them down into simpler pieces. Second, cell-free systems are robust and remain stable after freezing (and even freeze-drying), which allows them to be produced on a large scale and deployed in applications from low-cost diagnostics to the on-demand production of biologics – such as vaccines – for personalized medicine. And third, because they are not alive, cell-free systems can be used to produce compounds that go beyond the scope of traditional biomanufacturing methods. And they pose no risk of self-replication or biocontamination outside the laboratory environment. As part of their study, the researchers assembled a number of genes from their library to construct a biological logic gate. In electronics, a logic gate takes an input of electronic signals, performs a computation, and generates a binary output: one or zero. Similarly, the scientists' biological logic gate takes an input of transcription factors and generates a binary output: the gene is either on (activated) or off (repressed). "Numerous logic gates exist naturally within living cells, which use them to regulate normal biological function," says Laohakunakorn. "By building artificial gates, we gain the ability to introduce new functions into cells for therapeutic purposes, for example. The cell-free system is a first step in this direction, and future work could involve optimizing the design of our transcription factors using the platform, before deploying them directly in a cell-free application, or reintroducing them back into living cells."